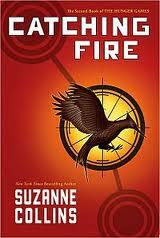 The second book in the Hunger Games series, Catching Fire, picks up where the Hunger Games left off. I was so happy about that. I wasn't sure what to expect, to be honest, because I thought that it might just end up being another arena book... and in some ways that was true, but not in the ways I expected. Peeta and Katniss end up in Victor's Village, but all is not peaceful; of course, we all knew that there would be a little tension between her and Peeta and Gale, but the tension builds to such a point that you aren't even sure who you are rooting for! Collins in brilliant in this regard. Her love story is complex and kept me guessing the whole time. This book is filled with emotion as well as new and exciting characters. I don't feel I give anything away in saying that I loved meeting the other victors of the Hunger Games in this book. Again, Collins paints a vivid picture of the futuristic world of Panem and we get to see even more into the different districts and their people, which I loved. And I have to say that I love the futuristic and yet downtrodden world she creates. There is some harmonic about the futuristic world that contains so much of worlds past in it as well; no cars on the roads except in the wealthy capitol.... that sort of thing. It's fascinating and yet I could visualize it so keenly. A moment on the love triangle that doesn't read like a triangle at all... someone asked me if I was "team Peeta" or "team Gale." Puh-lease! I am not on either one of those teams. I am team Katniss! I want her to make a choice that is authentic to her, and I am not sure she is totally sound in who she is yet. For gosh sakes, this girl is just coming down off the Hunger Games... and this is NOT Twilight! This is totally and utterly different and I resent the comparison. Sheesh. Either way, if you decide to pick a team or not, everyone can agree that this book lacks nothing in the way of plot, entertainment, and constant surprise. I was seriously neglecting life by the time this book got into my hands because I just couldn't put it down. It's just... brilliant. The Hunger Games books are like potato chips. Once you pop you just can't stop!